Knock Your Block Off! 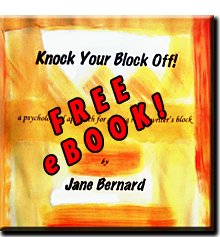 is a psychological approach to ending writer’s block. It’s about how your mind works when you write. When you realize how your creative psyche works with your intellect and emotional drive, a block becomes a signpost. Recognizing how your thoughts flow or are censured, means you can sidestep the frustration of feeling blocked, and stay in the flow. The writing process is a focus that can border passion, even obsession. Creativity can feel like a tease full of excitement and potential. Any thing that gets in front of where you want to go with your writing is a block. When this happens, Knock Your Block Off! and give your self the freedom of a fresh perspective. should get them back on shore!" Betty Jo Tucker, film critic, radio host and award-winning author. - The moment you decide to write, your intellect and your emotions are in sync. - The creative process is not designed to go smoothly. - When the pressure to write outweighs the flow of saying what you mean, so people will know where you're coming from, and can get your point, you are knocked off balance and confronted with writer’s block. Rituals - Writing rituals are warm up exercises signaling your mind that you are ready to write. The Rules - There are rules for knocking writer’s block out of your way. It Happens To Everyone - Every writing experience runs the emotional gauntlet. Ego-Enhanced Writer's Block - The ego experiences writer’s block as a threat. Emotional Writer's Block - Emotional writer’s block is a kind of perverse one-sided love affair. Technically Blocked? - Technical writer’s block is a struggle of will between what needs to be said, and what you want to write. of Knock Your Block Off. .epub format - Stanza readers and others. Open industry format. .lrf format - Sony readers. .mobi format - Kindle readers. .pdf format - Adobe PDF format. .pdb format - Palm devices and readers. .rtf format - Rich Text Format readable in word processors. .txt format - Plain text. Can be read by most devices but lacks most formatting.